As an outdoor sport, cross country is beholden to Mother Nature. If she proclaims snow, we run in snow. If she favors a deep freeze, we run in bitter cold. The competitors in the 36th annual Rockland Alumni Cross Country Run/Bill Markiewicz Memorial at Bear Mountain on November 24 encountered another seasonal challenge: ice. Ice at the boat dock turn. Ice at the far end of Hessian Lake, beneath the rustic Overlook Lodge. Ice on the leaf-covered descent from the monster ski jump hill. Throw in some mounds of snow deposited directly in our path, near the ice skating rink, and the carefree frolic became more of an exercise in survival strategy and balance management. One entrant who had experience navigating slippery surfaces was Chuck Maze, from North Rockland’s class of 1973. During his Hall of Fame career as a running back for the Red Raiders, he toted the football over many a muddy and icy playing field, including the classic Thanksgiving Day victory over Clarkstown North on an ice-bound gridiron in 1972. 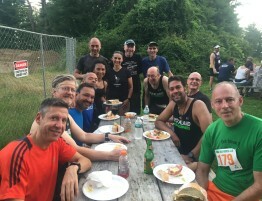 It certainly was not the worst conditions ever encountered by the Alumni harriers at the race, co-sponsored by the Rockland Road Runners. That distinction belongs to the inaugural affair in 1983, when pelting hail, snow and fierce gusts chilled participants to the bone, and wind-whipped ripples from Hessian Lake lapped onto the course’s walkway pavement. 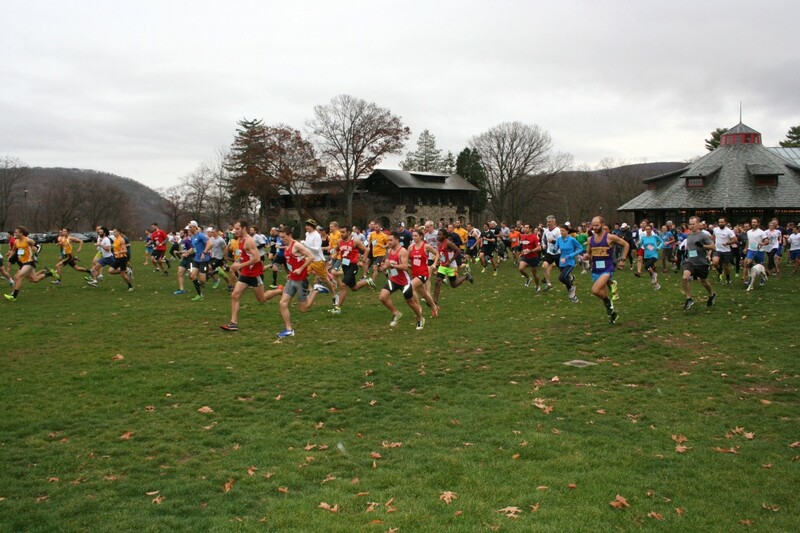 Nor was this year’s event as formidable as the 2014 edition, when ice around the lake and on the mountain necessitated a course revision limiting the runners to the playfield area between the majestic Bear Mountain Inn and the Merry-Go-Round. Jay Kaplan can tell you about tough running conditions. The 1967 Spring Valley graduate has participated in the Alumni Run 27 times, including this year’s renewal, and has faced the gamut of weather elements. Kaplan was on hand to receive the Bill Markiewicz Award, presented annually to a person who has made a significant contribution to cross country in Rockland County. Kaplan has been a Rockland cross country and track official since 1980. At Spring Valley, he was an All-County cross country runner and one of the top half-milers in the county. He also competed in cross country and track at SUNY Albany. The Markiewicz award was presented to Kaplan by Janet Markiewicz, Bill’s widow. 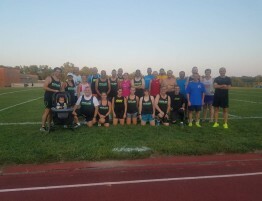 As always, the Markiewicz family was well represented in the race, with two of Bill and Janet’s children, Danny Markiewicz, Goshen class of 1996, and Matt Markiewicz, Goshen class of 1993, as well as Bill’s brother, Mike Markiewicz, Albertus Magnus class of 1970. Bill Markiewicz was a 1967 graduate of Albertus and the head coach of Clarkstown North’s cross country team from 1978 to 1989. He was a larger-than-life figure whose charisma and fiery personality endeared him to everyone in the local running-sports community. Markiewicz died of cancer in 1991 at age 41. One of Markiewicz’s ex-protégés, Mike Rogan, made the trek from Evansville, Indiana to reunite with former Clarkstown North teammates and have another crack at the demanding Bear Mountain layout. Rogan’s journey has not been an easy one. Perhaps the greatest runner in school history, Rogan, from the class of 1986, suffered a traumatic brain injury in July 2013. He had fallen down two flights of stairs at his home in Indiana and sustained severe facial and skull fractures. Through arduous rehab work he has improved his mobility, though his injuries have left him unable to return to work. He had been an emergency room physician and medical researcher in Indiana. In a Hall of Fame career at North, Rogan won the state indoor title at 1,000 meters, ran the third-fastest time in the country in that event in 1986 (2:29.59), and swept the 5,000, 1,500 and 800-meter races at the spring county championships. At Notre Dame, he set a still-standing school record for the indoor 1,500 meters (3:47.64) and ran the equivalent of a 4:02 mile. Thirty-three years ago, Rogan won the Rockland County cross country title at Bear Mountain in a sizzling time of 15:05. This year his goals were more modest: complete the course and perhaps improve upon his time of 43:25 from last year, his first year back since the catastrophic injury. Consider the mission accomplished, as he finished 146th in 36:23. Somewhere, Coach Markiewicz is smiling. Among the other notables competing in the race was Donna Hudson, Albertus Magnus class of 1965. When she attended Albertus, there were no scholastic cross country or track programs for girls. Hudson quit smoking in 1977, started running to control her weight, and rediscovered an athletic gift first revealed during her youth in West Nyack, during neighborhood races against the boys. Long distance became her forte: she set an American women’s record (15:31:57) at the 100-mile distance in 1983, and broke the American record in the six-day run (yes, six-day run) three times, setting the final mark of 487.9 miles in 1987, when she was 40. At Bear Mountain last Saturday, Hudson was content to circumnavigate the course. Despite a mid-race wrong turn that cost her several minutes, she got back on track and finished one place behind Rogan, 147th in 37:20. In the competitive results, Monroe-Woodbury of Orange County swept the individual and team laurels for the second successive year. John Dove, class of 2014, last year’s runner-up, prevailed in a head-to-head battle with 2016 champion Evan Ward, Suffern class of 2012. Dove’s finishing kick gave him a three-second margin of victory, in 15:57. Ward clocked 16:00, followed in third by Nick Roosa, Tappan Zee class of 2003, in 16:17. Roosa won the Alumni Run in 2005 and 2011. On the women’s side, Monroe-Woodbury took the top three places, led by winner Elizabeth Wasserman, class of 2013, in 18:44. She was followed by 2017 champion Suzanne LaBurt, class of 1981, in 20:30, and eight-time titleholder Julianne Littmann-Viscardo, class of 1995, in 21:18. The Crusader women posted a shutout score of 15 points to capture their ninth straight team crown and 15th overall. The Monroe-Woodbury men were also dominant, tallying 34 points to win their second consecutive team title and seventh overall. Goshen edged Pearl River for second, 68-69. The M-W Crusaders also had the most participants for the ninth year in a row and 16th overall. 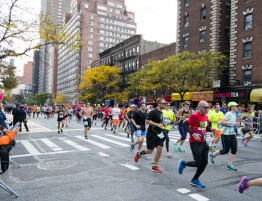 They constituted almost one-third of the field, with 51 male and female entrants out of 164 finishers. The race attracted participants representing 41 high schools in nine states: New York, New Jersey, Connecticut, Massachusetts, New Hampshire, Ohio, Indiana, Michigan and California. Entrants’ ages ranged from 18 to 76. Among the international participants were Sir Alister Renwick, St. George’s Secondary School, Grenada, class of 1975, who finished 56th in 23:18, and twins Ina and Kim Koeder, Evangelisches Schulzentrum Michelbach, Germany, class of 2013, who placed 95th and 96th in 26:38.5 and 26:38.9, respectively. The Koeders were standout soccer players and track athletes at Dominican College, class of 2018. 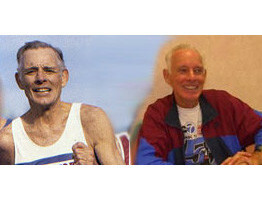 Larry Beckerle, Albertus Magnus class of 1973, extended his unparalleled streak of 36 consecutive Alumni Runs completed. 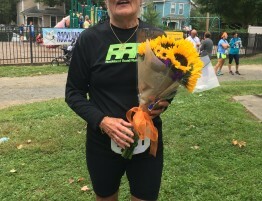 Fully back in action after a partial knee replacement in December 2017, Beckerle, the longtime track coach at Nanuet High School, finished 113th in 29:16. 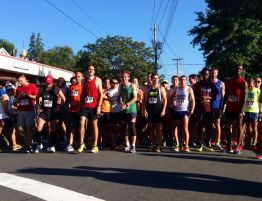 Race Results: 30th Annual South Nyack 10 Miler!